Sanabelle Urinary+ delivers high quality protein packed in the gluten-free kibble with great taste. Rich in natural chondroitin and glucosamine to support and maintain bone cartilage. 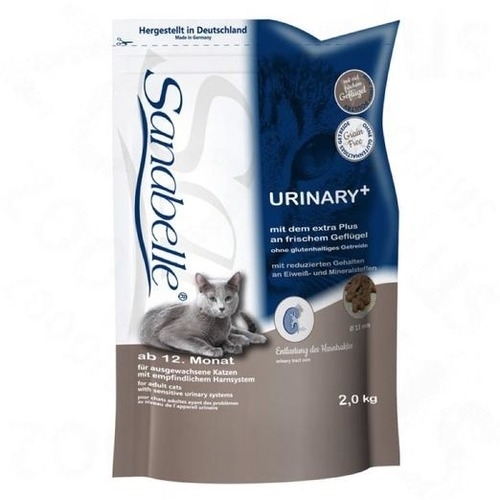 Sanabelle Urinary Cat Food for adult cats with sensitive urinary tracts, reduces stress on the kidneys and abstergent organs, exceptionally tasty and digestible. 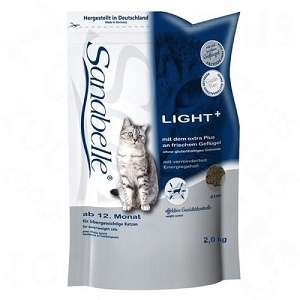 Sanabelle Urinary Cat Food is especially intended for any adult cat that has a sensitive urinary tract or organs. Due to a reduced content of protein and minerals and the accompanying reduction in by-products that lead to urinary tract disturbances, Sanabelle Urinary reduces the nutritional/metabolic stress on the kidneys and related organs. Important natural anti-oxidants like vitamin C and E as well as the trace element Selen protect body cells against metabolic by-products and slow the aging process. Your pet's water intake and excretion is supported naturally by the specially developed "Water-Transit-Agent" to prevent kidney stones and other kidney health issues. High content of Omega 3 and Omega 6 fatty acids in combination with an especially effective organic zinc-compound (Chelate)ensure healthy skin and a full coat and supports your cat's vitality by strengthening his/her natural resistance to disease. Due to the addition of that contain natural Saponins, the odor from your cat's waste will be minimized. That will increase your cat's nutrient acceptance and encourage the growth of gut flora. 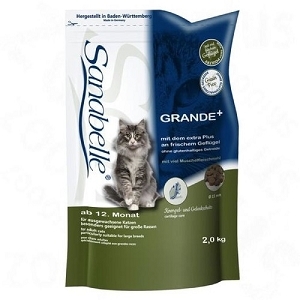 Certain plant fibers in Sanabelle minimize the formation of hairballs and make it possible for hairballs to pass through the digestive track unhindered. Effective combinations of special vitamins support your pet's natural eye sight and helps prevent sight loss due to aging. Sanabelle sets itself apart due to its superior digestibility. This allows your cat to absorb more nutrients and energy from less food. Smaller proportions of food equal smaller amounts of waste. Due to the carefully selected, high-quality raw materials, Sanabelle is exceptionally tasty and can be fed to cats used to canned food. Experienced breeders and owners continue to corroborate this. 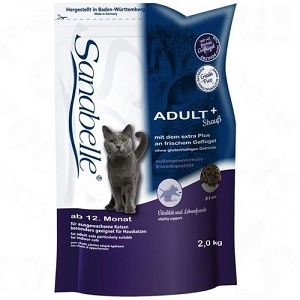 Due to intense and original research and development, the close collaboration with accredited academic institutions and last, but not least, the cooperation with successful breeders and experienced cat owners, Sanabelle has proudly created an innovative, balanced, premium dry food for cats. In Sanabelle you'll find only carefully selected ingredients, that passed through stringent quality controls during their manufacture. For this reason Sanabelle uses the highest quality animal protein such as chicken and eggs and no meat meal. And, of course, Sanabelle contains absolutely no artificial coloring, flavoring, or attractants. Sanabelle is also produced without genetically altered organisms. rice, lard, ground poultry, barley, ground liver, ground meat, meat hydrolyzate, ground fish, cellulose fiber, graves, dried egg, flax, fish oil, calcium chloride, yeast, lingon berry, blueberry, marigold blossom, chicory powder, yucca extract.